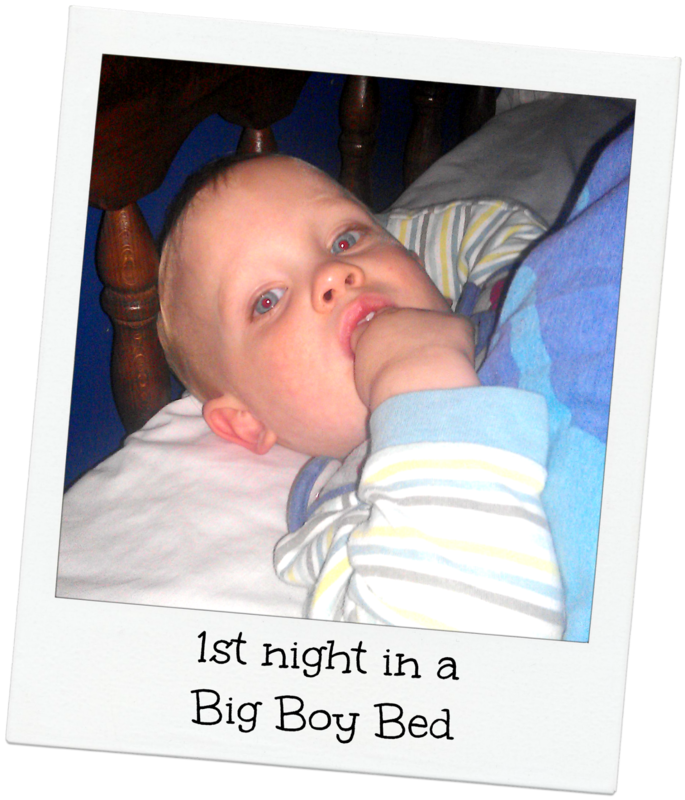 Time to move my youngest child out of the nursery and into the Big Boy Room. We've moved each of the lads on their 2nd Birthdays, and made it a part of their birthday. Kind of a "Congratulations, you're 2 now. No longer a baby. Welcome to your new Big Kid Bed!" Mainly because by the time each of them is 2 there's a younger sibling either on the way or here already, and I want the older child settled before the newbie needs the cot. Then we can avoid the whole "Baby stole my bed!" drama. With George we are starting a few days early. Not many! His first night in his new bed was Tuesday, and his birthday is Friday. I moved it up because it's the Easter Holidays, and Georgie is a screamer come bedtime, and it made sense to get him moved during the holidays instead of in term time so that he didn't disrupt Jack & Tom too much in the night while they had school and nursery to go to the next day. It's more than just Georgie moving though... Jack has moved into the loft bed (supplied by Grandma), and Tom has moved into the top bunk that Jack had just vacated, leaving the bottom bunk free for Georgie. AND THEY SAID WE COULDN'T FIT THREE KIDS IN THAT ROOM! Been a long job tonight but not as long as I expected so that's good! Georgie has been denighed his afternoon naps since before the weekend, and tonight I took him up to bed a little early (10-15 mins or so), tucked him up in the bottom bunk and read him a couple of stories. He's used to this, he gets to join his brothers for a story some nights. Then I tucked him in again and said good night. We've been telling him for ages that this would be his bed soon so it wasn't a total shock. It took around half an hour of putting him back to bed before he stopped getting up and trying to get out of the bedroom. He cried. It was difficult for both of us. Even Bean got distressed by his cries and started jumping about, making me feel a bit sick. But they were cries of rage not distress. George hates going to bed regardless of what bed or where. This is the first bed he's been able to get out of on his own! I think half an hour was pretty good going! We gave it half an hour of hour of silence before hubby took Tom to bed (under strict instruction to stay quiet) and they almost got away with it! Until Tom's new mattress protector rustled as he climbed under the covers and woke George up. Not too bad though.... He sat up and cried briefly but settled down without a fuss. Even when Tom climbed down from his bunk and burst out of the bedroom shouting "Georgie's crying!" he settled himself before I got up stairs to check on him. Another half hour and I took Jack up. Again, he was silent as a ghost and crept in to his loft bed (only banging his head once) without disturbing either of his brothers. I took a glance at George. He was sleeping sideways on with his head resting on the puff next to his bed (where me or hubby sit to read stories). He was sound asleep and snoring so I thought better of trying to move him, even though I couldn't help but think he might fall out of bed altogether. No sooner had I gone downstairs than I heard THUMP WHAAAAA! Guess who fell out of bed?! So went back up and found George sprawled out on the floor. I scooped him up and tucked him back in... Another token cry and then nothing! I'm measuring everything in half hour chunks this evening.... It's now half an hour since all 3 boys were settled in their new beds, and all seems quiet and calm. I'm wishing I'd got the top stair gate fitted again incase Georgie gets up and starts wondering about in the night, but I can block it off and make it secure for one night, see how it goes. I think I might be keeping out bedroom door open tonight too, just in case! Hopefully tomorrow night won't be any harder! it was much easier tonight! Georgie still tried it on, but when I stopped coming in to put him back to bed he soon stopped creating. After he'd been quiet for a bit I came downstairs figuring he'd prob go to sleep on the floor and need putting back to bed when his brothers went up, but when I took them he was in his bed, under his covers, and fast asleep! All three now tucked up n quiet bliss! Although Hubby says he heard Georgie cry at around 2am this morning. He settled back down so Hubby didn't go into him in case he disturbed him further.... we found him asleep on the carpet this morning! Although totally unphased by it. If he's still falling out of bed over the weekend I'll buy him a bed rail on Monday. It's a tiny tiny drop, being a bottom bunk. He can climb back in by himself - I've seen him - but only with the light on! I think he couldn't find his way back into bed. I'm not worried about getting him to settle tonight now though. I think he's worked out that this is his bed now. Just need to get the new bedtime routine cracked before school starts again!